Could be the BC337 transistor replaced with the BC337-16 transistor? The first one has a HFE/63 and the second one HFE/250. I'm asking this just because my supplier have only the BC337-16. The "-16" doesn't have anything to do with the hFE, it's the maximum voltage rating. I tought that had something to do with HFE because the difference showed on the list is only the HFE! Both have 45V and 800mA, changes only this HFE/value. At the end the question is if this BC337-16 model can be used with the BLM module, unfortunately i don't have a great knowledge about transistors, so i don't know if the max voltage rating can affect in a some way the BLM Module. Hello everyone! could 2 pins bicolour led be used? I've got a problem with a series of buttons. Four buttons/leds of I1 from J4_1 aren't working no more, i've eight buttons/leds connected to that line, so four are working and the other four no more. I've controlled buttons, diodes and leds, they are all ok, connections are also ok.
Where i've to indagate to solve this problem? I've to check the control board IC's, resistors and transistors? I've checked also the resistors and connections on the MBHP_BLM_SCALAR module, but they're all fine. 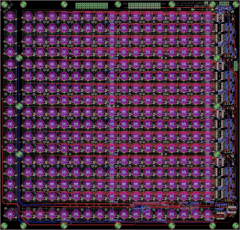 Could be the IC1 (74HC165)? But i don't know how to check if it have I0 input pin broke. In the meantime I could try to swap it with another one that i've as replacement. To Thorsten or mods, i don't know if it's off topic my question, if it is OT i'll delete this post and open a new thread. Did you build the BLM on a veroboard? First check should be to find out if only buttons or only LEDs are not working anymore. Buttons can be checked with a MIDI-Monitor: do they send MIDI events? If LEDs and Buttons are not working, the common line connections (C_x, blue signals in my schematic) are the reason. Yep, i've built it on a veroboard. Today i've re-checked all, and i've also disconneted all the AIN modules from the stm core, i've uploaded to the stm core the software that control only the blm module (deleting the ain and din encoder code) and now seems that's working all ok. So i think that's something related with the AIN modules and the jitter generated by them. Of course i clamped to ground unused inputs, but i've also a continue streaming of values on the mios studio midi input monitor. I'll try now to modify the deadband setting to "127" (5bit), but i was experiencing a continue streaming of data in the midi in (checked with mios studio) already with a deadband setting of "31" (7-bit). I don't know if 5bit is reliable as solution, but i'll try anyway to see if it's a problem of deadband. Last test will be a switch from usb to power supply unit to see if it's the usb to cause the jitter. I think that the STM32 based BLM + AIN modules are not a good combination. The multiplexed LEDs produce a lot of digital noise, and the analog inputs are only working in 0..3.3V range, accordingly the signal noise ratio is worse compared to 0..5V range used in PIC applications. I'm planning to provide a solution with cheap external 5V based ADCs soon (very soon), this will be interesting for you. Thank you Thorsten, i'll see forward for your solution. In the meantime i'll do that other tests and i'll update on news. The button is very small - 6x6 mm and with 6,5 cent very cheap. Cost would be arround 30-40 â‚¬ inkl. the acryl caps . I have tried these buttons (though I'm not sure they're the same force). The ones I tried were nice feeling, quiet, but a little too much force required to push for my taste. There are a few diffent types of the button, but the ebayseller does not tell what typ it is. When you have fixed the cap to the button, has it worked comfortable ? Do have some pics ? and report the results here. Hi, I've attached a pic, sorry about quality (from phone). The caps are 4.5mm, front panel is 3mm, button actuator is pretty much flush with base of front panel - so they stick out a nice amount. Many of them feel quite good. Some have suffered from excess glue which is blocking the motion - they are quite stiff but still successfully activate. 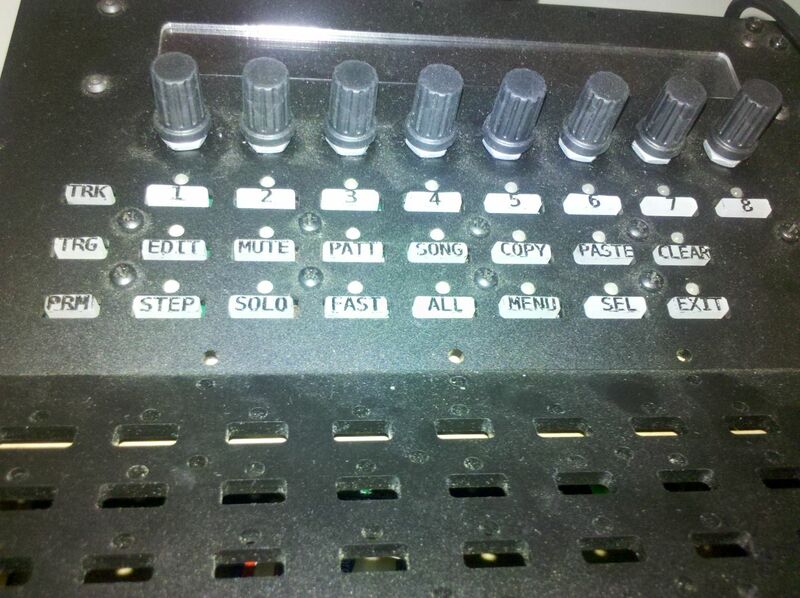 The cap rubbing on the panel makes it noisier than the bare button, but I still prefer this to clicky buttons. I'm also not sure how long the glue will last. I hope it works. And when the 0,5 mm acryl is transparent the button is illuminated by the Led. i saw this technic for the 16x4 BLM, but i can't find the post again. what do you think of this solution ? Here's a render of what I have so far. 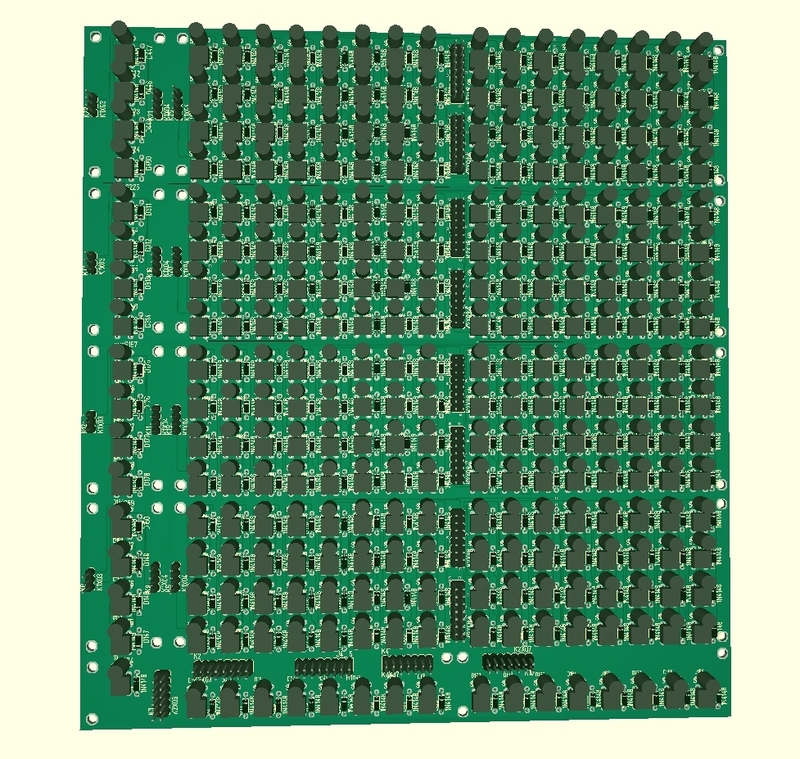 These are 10 PCBs connected together (for the sake of ordering them in an affordable manner). The bottom row needs some work still and the schematics and routing of the 16x4 boards need to be checked. I hope the Eagle file isn't corrupted or anything, since it's just an export from Target 3001. I'd be very grateful if someone could have a look at that schematic, just to make sure. Here's the schematic if anyone can be bothered. Good job, but I don't think that there are enough mount holes. These things are pretty long, covered in components and one would be applying pressure over the whole surface. Too much flex in my opinion. I already had those kinda concerns but those boards might seem longer than they actually are. About the length of a Midialf board which I have right in front of me - if i put it on the edge of my table and hold the other end with my hand and then put a lota pressure on it, it barely bends at all. In addition to that, those pin headers are actually on the backside of the board and the Scalar modules plug right into it, eventually serving as a spacers themselves. If that doesn't work out on my test boards, I can still order 2mm boards, rather than 1,6mm for no additional cost. Maybe run the Eagle DRC? There are two vias which overlap and many traces below the minimum clearance. Best of luck! Fixed the DRC Errors in the 16x4 board and the Extra 2 board. Used the OSHPark and Seeed Studio DRU btw. The schematics still need to be checked. Once I'm really, really bored maybe...won't be able to order these any earlier than end of this month anyhow. The traces are all fine if you go after OSHParks rules or the Seeed Studio ones. But a lota vias weren't. Oh and ignore the overlaps on the Extra 2 board, those are intentional. More or less.